Georgia Trend Magazine’s advertising account manager, Lane Henderson and publisher/editor in chief, Ben Young, pose for a picture before answering questions from local leaders and business owners who attended a discussion Aug. 29 where it was announced Lake Oconee would be spotlighted in the publication. The Lake Oconee area will be featured in the November issue of Georgia Trend Magazine. Economic develop­ment leaders, along with business owners and representatives from the three-county focus area, met with the magazine’s publisher/editor in chief, Ben Young, and advertis­ing account manager, Lane Henderson, to discuss layout and advertising opportunities. 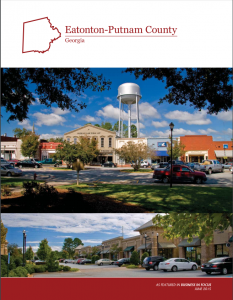 Georgia Trend will spotlight some of the numerous opportunities for growth in Putnam, Greene and Morgan counties, which all border the shores of Lake Oconee. Writers and graphic artists will team up to highlight area tourism, recreation, education, new business and industry— all of which Lake Oconee is primed for. “Georgia Trend Magazine has been in publication nearly 35 years,” said Young, whose father was the magazine’s former publisher/editor in chief Neely Young, said their goal is to shine a positive light on Georgia communities with a focus on opportunities. “Georgia Trend Magazine is the only publication to reach all 159 counties in Georgia,” Henderson said, noting the publication has a 150,000 readership, based on its 49,000 hard copy edition. The magazine also has a digital version. Like newspapers, actual magazine readership is much higher than sub­scription calculations. Henderson explained hard copies have a long shelf life and are passed around from person to person. Georgia Trend also boasts a readership to include some of the most affluent leaders in Georgia and the nation. That means businesses and organizations partic­ipating in the feature will be exposed to some of the most influential people in their field. Nearly 20 stakeholders from the Lake Oconee area engaged in the discus­sion, and most were from Putnam County. The group was able to offer Georgia Trend Magazine executives a bounty of information about the area’s greatest attractions and growth opportunities. Reynolds Plantation Lake Oconee marketing manager, Ashley Jeffers, and Beverly Berardo, director of marketing, noted the high-end com­munity was celebrating 30 years of development and continues to grow. 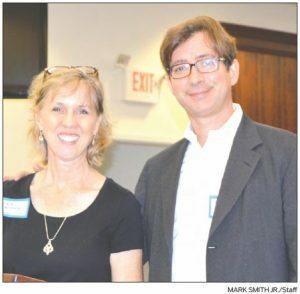 Kevin Tomson-Hooper, owner of the Artisans Village and Art Gallery, said the Lake Oconee area was seeing trend of popu­lation moving in creating opportunity to expand on cultural activities. Downtown Eatonton director, Andrew Simpson, who is also director of Eatonton Main Street, said Lake Oconee is seeing a lot of growth in senior citizens. “There is a push for senior housing and work­force housing,” Simpson said, noting the addition of Sumter Street Station apartments in Eatonton has been a boost to downtown Eatonton’s foot traffic. “The first of generation X hits 55 next year, we need to focus on them, they are not on anyone’s radar,” he said. With Putnam County’s education system one of the leading learning struc­tures in the state, local Central Georgia Technical College director, Carrie Dietrich, advised that institute and its programs should be emphasized. “The college and career academy at PCCSS need to be showcased,” Dietrich said. “Also, Lake Oconee Academy on the Greene County side,” Schwindler said, noting economic developers were seeing a lot of companies locating to property around the lake because of an attrac­tive cost of living at Lake Oconee. “It’s an untapped market,” Schwindler said. Smith Communications’ Director of Sales, Matt Plocha noted it was the quality of life in Lake Oconee driving people from metro areas. John Gus, of FFCI Concrete, runs a fami­ly-owned business with locations around Lake Oconee and surrounding counties. Gus said that adding to that quality of life was the ability to access Hartsfield-Jackson International Airport in Atlanta just as quick from Lake Oconee as it is from around the metro area. “With a lot less hassle,” added Lowell White, of Calvert & White Custom Homes. Simpson said that looking at saving that traffic time from an economic point of view, means saving money. Schwinder agreed, saying it’s 35 miles from Rock Eagle Tech Park in Eatonton to the Shire at Stanton Springs where Facebook executives announced last March they plan to establish a data center. Henderson said having three counties come together for branding is unusual. “I would like to know the history of that, was it state inspired or indepen­dent?” Henderson asked the group. Brooke Moore, mem­bership manager for the Eatonton-Putnam Chamber of Commerce, said the local COCs help market Lake Oconee. White said the attraction is tied to the lake. “It’s the common denominator that makes the three counties work together,” White said. Offering a 25 percent discount off regular advertising rates for those interested in being showcased along with the article, Henderson noted that the Georgia Trend Magazine feature can be used as a marketing tool for the whole area. “We want to show the strong working relation­ships between schools, government, businesses and development author­ities in the Lake Oconee area,” Henderson said.